Jolly Boat is a rocking toy boat designed to provide years of make-believe nautical adventure for the young sailor, It is an adaptation of the classic flatiron skiff, a type that generations of “old salts” remember fondly as their first “real” boat. 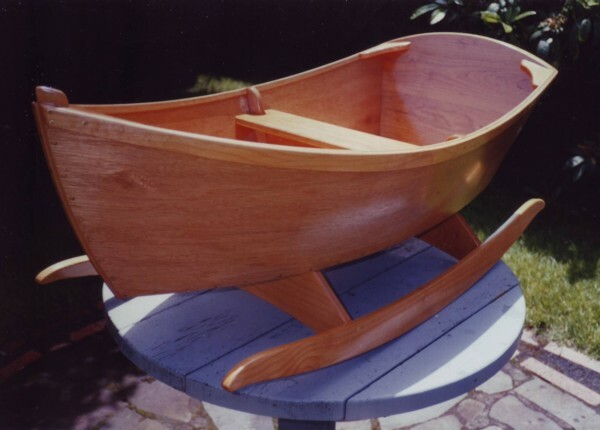 Jolly Boat has a length of 48″ and a beam of 23″. Construction is relatively easy, using mahogany plywood for the sides and common lumberyard materials for all the other joinery. About three days of enjoyable and satisfying work will see this delightful little craft to commissioning. The complete plans include full-size patterns for virtually every part, so there is no guesswork involved. To further clarify the building process, comprehensive construction notes describing all components are number-keyed to the corresponding assemblies in the drawings. Also included is a materials list. With the rocker assembly removed, the boat’s flat bottom allows it to be used on the floor as a play skiff or for toy storage.